CONTEST MONDAY: The Glimpse (Presenting Claire Merle) – WON by Jennifer Thomas! I can’t even say how excited I am to introduce you to a debut YA author who I’ve become friends with. I met Claire Merle at the Paris SCBWI conference last December, and we clicked right away. I was so happy to meet a Paris-based author because most of my other writer friends are a whole ocean, or at least an English channel, away. Plus, we have in common the fact that we’re both married to a French guy and are raising two young kids in the French system. PLUS, she too is a Young Adult writer AND is really really nice. I felt like I had hit the author-friend jackpot. When she told me about her book THE GLIMPSE, which will be published in the U.K. by Faber & Faber in June 2012 (and she’s waiting to hear about publication elsewhere), I thought, Wait until my readers hear about this! Sounds fabulous, right? And then, just a few days ago, Claire told me about the most awesome contest that she is holding for U.K. teens. And I thought I could call on you, my readers, to spread the word about Claire’s event—whether you’re in the U.K., the U.S., the Philippines, or anywhere else in the world…my THE GLIMPSE contest is international. So on this CONTEST MONDAY, I’m giving away something really special. A collector’s item. 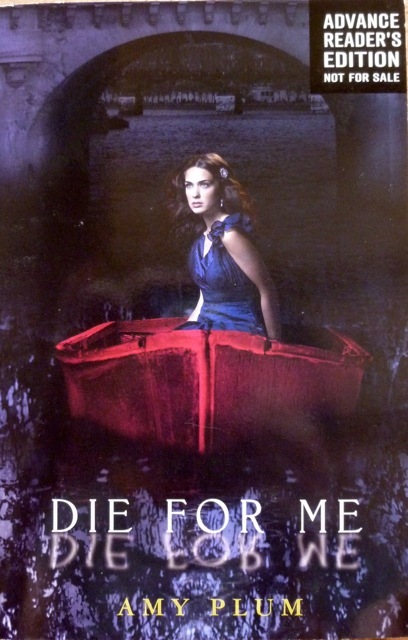 A signed copy of DIE FOR ME’s original American ARC – the one with the Kate-in-a-Boat cover! This is a points-based contest, and the number of points you earn is the number of times your name goes into the virtual hat of Randomizer.org to win the prize. 1 point: Say something about Claire and THE GLIMPSE on your FB page, Tumblr page or Blog. 1 point: (freebie) leave me a comment on this blog just saying “hi” if you only want 1 point, or giving me the links and/or info about the other points I should give you. That is 8 points you can earn in all. The contest is open internationally and will end in exactly 48 hours (Wednesday at 11am Paris time). SO…what is Claire’s amazing idea? Her publisher, Faber & Faber is holding auditions for the lead role in her book trailer. 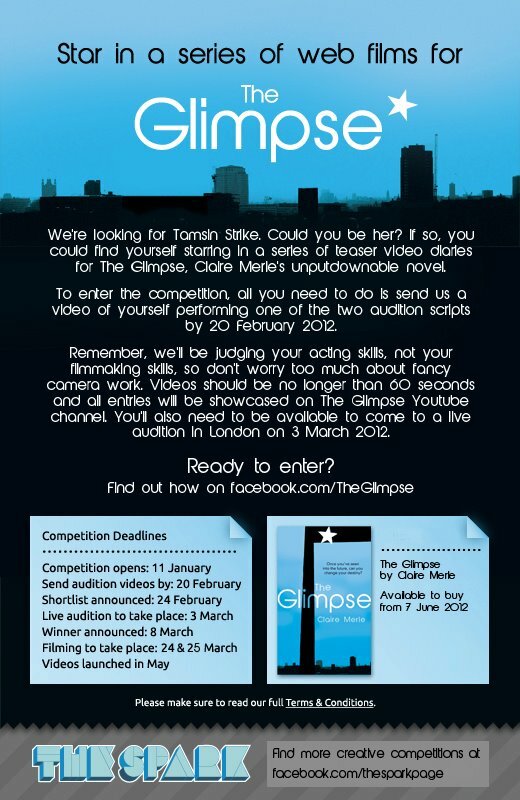 U.K. citizens between ages 13-18 have until February 20 to send their audition video. You can find the audition script and instructions here. And for your viewing pleasure, here is the contest video! Good luck to everyone with my THE GLIMPSE contest, and I can’t wait to see who will be chosen as the actress for Claire’s trailers! 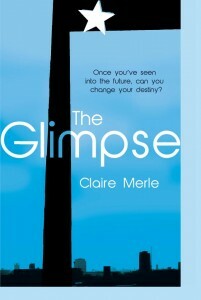 40 Comments to CONTEST MONDAY: The Glimpse (Presenting Claire Merle) – WON by Jennifer Thomas! HEllo:))) well i did all 8 things as you asked!! 1+Add her book to my Goodreads list! 1+added Claire to my Twitter…..
U rock thanks for this Claire’s book looks GOOD!! I follow both (Claire and The Glimpse) Facebook pages. That’s 3 points for me. Including the 2 points above. 1 point: Left a comment! I have a total of 6 points! 1+ I hope this book comes to the US. It sounds very interesting. Otherwise, I might have to be inventive in getting a copy. Oooh I want this. So badly. The Glimpse sounds amazing as well, and since I love dystopia, I’m so gonna read this. I wouldn’t have heard about this one if you hadn’t shared it! 1 point: (freebie) leave me a comment on this blog just saying “hi” if you only want 1 point, or giving me the links and/or info about the other points I should give you. – HI!!! 8 points for me! I seriously can’t wait to read The Glimpse! Well I added the glimpse to my goodreads.. Put a comment in my fb page! Hi and thanks for the intro to this book. Sounds great! 1 point: from Claire’s FB page, share her video (you will see it posted near the top of her posts) – Also done. Done all you have asked! – I may also audition for the role. Hello! What a fun contest. I love to meet new Authors and of course new books! Thanks so much. •1 point: Posted about Claire and THE GLIMPSE on your FB page. •1 point: (freebie) leave me a comment on this blog just saying “hi” if you only want 1 point, or giving me the links and/or info about the other points I should give you. Thanks again for another fun contest! I follow Claire’s FB page under Lane Bittick. I shared her video on my page. I added it to my goodreads list. And I am saying Hi! + 1 for saying HI! +1 for saying Hi!!!! And thanks for the giveaway Amy! Added book to Goodreads list. Follow the Glimpse’s FB Page. hi! i got 7 points :)) thanks! HI!! That’s one point, right? I think that adds up to 5 total entries! Thanks so much for this opportunity to win! – Claire’s FB page: Liked under Alaiel Kreuz. – Book added to my Goodreads list. 1+ leave a comment — This is an awesome giveaway!!!!! 1 point: Leaving a blog comment!! Thank you so much for the contest, I love it when authors spread the word about other authors. It’s the best way to get the word out! 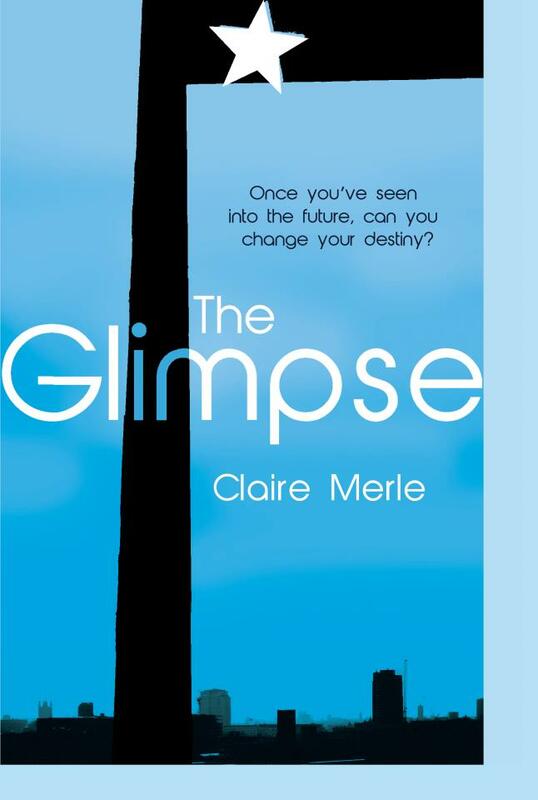 Can’t wait to read your follow up novel as well as Claire Merle’s The Glimpse!! Equals out to be 8 points! 1 point: (freebie) leave me a comment on this blog just saying “hi” if you only want 1 point, or giving me the links and/or info about the other points I should give you. : Done. +1 I followed the book’s FB page. Nothing special done here but I did love Die for Me. 5 points for me. I am following both fb pages, twitter, tweeted about the contest, and the freebie. Thanks! +1 Stopping by to say hi. And thanks once again for the giveaway and for making it intl!! That's 6 Points for me ^-^ Thanks for the giveaway! YAY 202 points total for everyone. Thank you so much for playing and for following our new YA rising star, Claire Merle. Please continue to support her! AND THE WINNER IS: JENNIFER THOMAS! CONGRATULATIONS! Jennifer, write me an email (address is on my Contact page) and give me your mailing address, let me know how you want me to dedicate the book (or just sign it) and I’ll pop it into the mail for you. Again THANK YOU EVERYONE for participating!